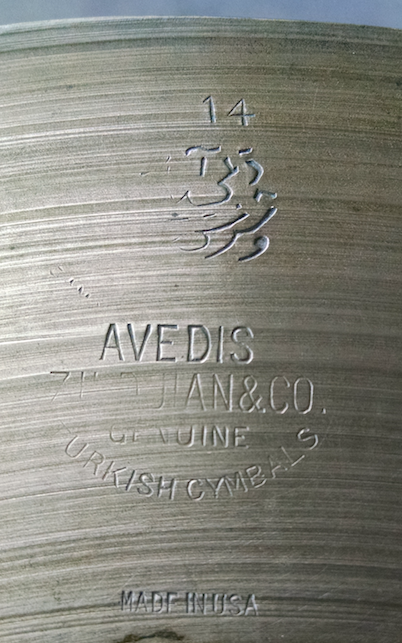 I forgot to mention that while I was there the very first vintage A that I found that it had a trademark type variant that I've never seen before...a true one off; it's a trans of stamp variant, but with larger font for all three of these: the "Avedis Zildjian", the "Genuine Turkish Cymbals", and "Made in U.S.A." In addition the Arabic script is a uniquely different design than any other that's been seen before. This was of a completely unexpected discovery. So just when I thought that I've seen everything, Then I find that there's yet some more. Do we get to see it? Was the Ottoman script anything like this one? This one has a few other unique attributes which I haven't seen elsewhere like the diameter (14), and the size and positioning of the AVEDIS, and the all caps CO. which is way ahead of its use in the 80s. But in this early version it is & CO. 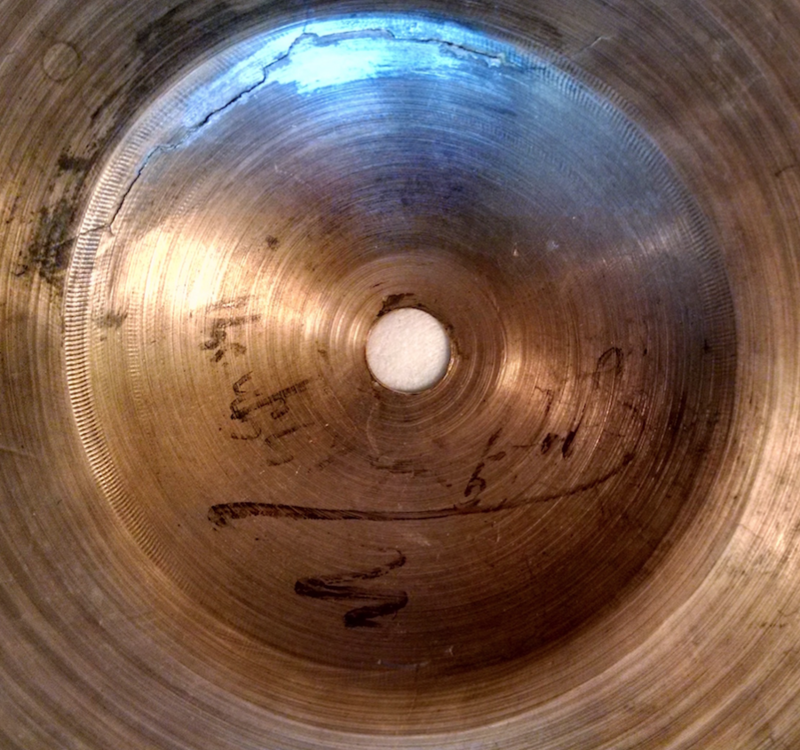 This cymbal also has a signature on the underside of the bell. Thanks for the interest in this cymbal! It was great to meet Bill and thank him in person for his amazing contributions and research towards understanding the history behind these wonderful instruments we are obsessed with. It was particularly fun to discuss things like "old stamp type 2a" and "type 4b" with the guy who actually identified and came up with the terminology that we all use! Last edited by paulwells73; 04-13-2019 at 10:48 AM. Do we get to see it? I'd love to show you but I'm unable to post my photos here since I began using My Drive (Google Drive) as my picture hosting site. It's the "https" format that's causing the problem. I contacted the webmaster about my problem but got no response from him. Have you any suggestions for a free (I'm cheap) photo hosting site that uses "http" type format? If I can solve this apparent glitch then we can see what I have and compare these two. Imgur may work for you. where we see that in the absence of images you can line up all the experts and you would still not reach a conclusion. Last edited by zenstat; 04-13-2019 at 03:46 PM. I was able to post to this site using a Google Drive photo. If you're using a photo from your computer's file in order to post a photo, then what's the point of using Google Drive in the first place? Yeah, sure I'm able do that too. But you're completely missing the point here. Did AVEDIS stamp that 14 into the cymbal. I don't think I ever seen that before. Yep, it's a bummer Google Drive doesn't suit all our desires at the moment, but until it does, that is what we are stuck with.